Garon Grit™ 240 contains aluminum oxide quartz which is second in hardness only to diamonds. 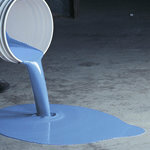 Broadcast Garon Grit™ onto wet floor coating and backroll prior to applying top coat. Use for any of Garon's floor coatings provided it is topcoated with Garon's chemical and abrasion resistant topcoat, Garon Hi-Gloss.